Words have two ‘meanings’: denotative and connotative. 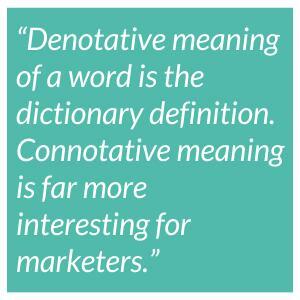 Denotative meaning is the dictionary’s definition of a word. Connotative meaning is far more complex, and far more interesting for marketers. Consider the word ‘mother’. Denotatively, the word ‘mother’ simply means ‘a woman in relation to a child to whom she has given birth’. Connotatively, however, it means and evokes so much more in each one of us. We hear the word and immediately we imagine a face, a smell, a voice, a place, a feeling. In short, the words you use don’t exist in a vacuum. Each person who reads them has an individual (and connotative) response to them all. Many of these connotations you can rely on (such as “Free,” “Now” and dollar signs) but some are more complicated (such as Mother, for instance). Of course not every business will see a 15% conversion increase by adding “It’s free!” next to their signup button, but this case study nonetheless makes an effective point: When communicating the value of engagement with your business online, don’t forget that nothing’s more tempting than free. Money has more connotative value than, arguably, anything else. In our consumerist culture we see money and we see the things we could buy with it, not the note itself. We see new shoes, a college fund, our next holiday, supporting our family. When mentioning dollar values, use the dollar sign if you’re discussing discounts or offers and remove it when you’re selling. (Here’s the study from Cornell which backs that up). Focus your landing page copy on pronouns to develop relationship and appeal to your visitor’s ego. Use “you”, “your” and customer testimonials.